It has been an incredibly long half-fortnight. Hospital stays, work shenanigans, and an utter inability to concentrate. So here’s a cat trippin’ balls. Excuse me. 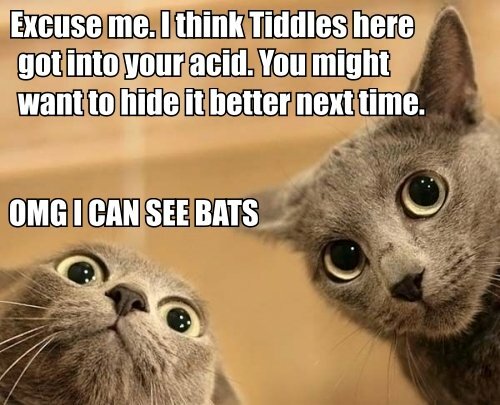 I think Tiddles here got into your acid. You might want to hide it better next time. At the beginning of the month, I was fairly ambitious. I’d discovered the glory that is Dropbox, and backed up my drafts. I’d also just gotten my daily dose of gonzo writing tips from over at terribleminds, and so I was ready to go—two Nooks loaded with things to remember, a notebook full of other things. Then Jeannie, my sweet computer, caught a nasty little infection of malware. The probable culprits: sneaky flash imbeds that probably originated from deviantART (which has recently been updated and now is a bit buggy) and a malware removal tool that I got from CNET—and I wish I’d heard about the malware fiasco before it’d happened, or else this wouldn’t have happened. It took a week to find the problem, another week to finish fixing it. I’ve lost half the month to computer trouble. Of course, that means that the plan is almost shot—or is it? Finishing this revision by my birthday was the goal. The deadline for redeeming my Createspace code is the end of June. Of course, it won’t be totally done then, but this is aiming for a different milestone: a proof copy. Wait, did I just call chocolate ‘minimal?’ Crud! I’ve committed sacrilege! Blasphemy aside, I have a winner code that entitles me to a few proof copies from Createspace. Tangible goals help keep me focused, and what’s more tangible than an actual book in the hands? *hefts hammer* You ready for this, Part I? Last week I boasted of a grand attack plan for my manuscripts. Everything was set up and all that had to be done was just starting things up. Enter the computer malware assault from Hell. Preliminary intel suggests the fourth circle as its origin. The fix? Today, I must nuke the OS from orbit and perform a full reinstall. At least I know now why poor old Jeannie was behaving so oddly. I just wish it hadn’t cost me a week. “25 Ways To Unfuck Your Story:” Perhaps one of the best-timed essays over on terribleminds since I started reading the blog in September of last year, I’d spent the majority of February wondering how I’d take the thing apart and make it sing. …here I go again with the mixed metaphors. Oh well. Bugger it. The first draft of Genesis—the actual first draft of Genesis—was pretty thoroughly fucked. That was why I took a hammer to it, busted it up, and harvested only the parts that worked. The rest didn’t see the light of day until yesterday, and that was just to do a side-by-side comparison. Bits and pieces of it made sense—but that was exactly the problem. Bits and pieces of it made sense, but only when you took them as bits and pieces, disassociating them from the whole. That’s fine in short stories, but in something that was planned to be a novel-length undertaking, that just won’t do. Nope. Please don’t look at me like that. This makes perfect sense. Suppose you have a draft coming up. You’re editing as you go, and putting things together bit by bit as you go. Suddenly, once you’ve finished, you realize a change that you made somewhere around page—oh, let’s say 53—totally conflicts with the information you’ve provided on page 82. In the spirit of bringing together things as fast as possible, you’ve managed to create a big, yawning plot hole. Once you notice it, you patch it up and soldier on—except that by page 134, you notice that the facts established originally on page 53 work better than the solder-job that you’ve done to mesh it with the hole on 82. TRACK ALL OF THE CHANGES. Yet another lesson learned from terribleminds. Honestly, I’ve learned more practical writing tricks there than I did in school. Now, it’s time to backup my backup and get started.